On Sunday I bought a book called “Serger Secrets” 1998, Rondale, Inc., edited by Susan Huxley. Since I am going to be teaching sewing I thought it would be a good idea to practice various serger techniques. 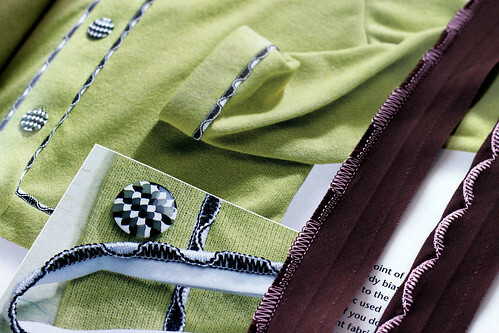 I saw a trim in the book that used bias binding make decorative piping. The directions said to stop the needle thread with the finger to add tension and cause the under loop thread to come to the top making a wavy line. I thought it looked easy and cute. Well, adding tension to the needle thread does nothing. The tension needs to be added to the upper loop thread meaning the front of the machine needs to be open while you sew. Yes, my fingers got whacked a couple of times while trying to stop the upper looper thread with my index finger. I think it would work better stitched with heavier threads in the loopers. I might even add some knitting yarn to pad the stitching a little. I used a piece of left over brown bias from an apron I finished recently. Since I really didn’t like the serger trim I was making I thought I would try a regular machine decorative stitch. I didn’t like that either. I ran out of the bias and didn’t want to rip out again for another try. This experiment is therefore on hold for the time being. I will share photos of the apron tomorrow. That is another story. This entry was posted on Tuesday, July 14th, 2009 at 3:00 am and is filed under Sewing. Tagged: Sewing. You can feed this entry. You can leave a response, or trackback from your own site. Oh, I SEW want a surger!!! !